A new study reveals that all children with Crohn’s disease who were examined had a commonly occurring virus – an enterovirus – in their intestines. This link has previously not been shown for this chronic inflammatory intestinal disorder. The findings were published online on June 27, 2013 in an open-access article of the international journal Clinical and Translational Gastroenterology. These findings need to be confirmed in larger studies, but they are important, as this connection has never been pointed out before. This paves the way for a better understanding of what might be involved in causing the disease, says Dr. Alkwin Wanders, one of the scientists behind the study at Uppsala University and Uppsala University Hospital in Sweden. In Sweden, several thousand adults live with Crohn’s disease, and each year about 100 children and adolescents develop the disorder. The disease affects various parts of the gastrointestinal system and causes symptoms such as stomach aches, diarrhea, and weight loss – in severe cases fistulas, or strictures in the intestines. The cause of Crohn’s disease is not known. Mutations in more than 140 genes have been shown to be associated with the disorder, but this genetic connection is not a sufficient explanation. Many of these genes play key roles in the immune defense, which has prompted theories that the disease might be caused by impaired immune defense against various microorganisms. In that case, the disease would be a consequence of interplay between heredity and environment. Recent research has shown that some of the genes that are strongly linked to the disorder are important for the immune defense against viruses that have their genetic material in the form of RNA, so-called RNA viruses. A new palm-sized microarray that holds 1,200 individual cultures of fungi or bacteria could enable faster, more efficient drug discovery, according to a study published June 25, 2013 in mBio®, the online open-access journal of the American Society for Microbiology. Scientists at the University of Texas at San Antonio and the U.S. Army Institute of Surgical Research at Fort Sam Houston have developed a microarray platform for culturing fungal biofilms, and validated one potential application of the technology to identify new drugs effective against Candida albicans biofilms. (Image shows a generic microarray, not the newly developed one.) The nano-scale platform technology could one day be used for rapid drug discovery for treatment of any number of fungal or bacterial infections, according to the authors, or even as a rapid clinical test to identify antibiotic drugs that will be effective against a particular infection. "Even though we have used the antifungal concept for development, it is a universal tool," says co-author Dr. Jose Lopez-Ribot of the University of Texas at San Antonio. "It opens a lot of possibilities as a new platform for microbial culture. Any time you need large numbers of cultures, this has a big advantage over other methods. The possibility exists to use this same technology for pretty much any other organism," he says. Microbiology and medicine have become increasingly reliant on micro- and nano-scale technologies because of the increased speed and efficiency they can offer, but until now the cultivation of microorganisms has mostly been conducted on larger scales, in flasks and in trays called micro-titer plates. The microarray technology enables the user to rapidly compare hundreds or thousands of individual cultures of bacteria or fungi, a big benefit in the search for new drugs to treat infections. In women who have type 2 diabetes and show signs of depression, vitamin D supplements significantly lowered blood pressure and improved their moods, according to a pilot study at Loyola University Chicago Niehoff School of Nursing. Vitamin D even helped the women lose a few pounds. The study was presented at the American Diabetes Association 73rd Scientific Sessions in Chicago. "Vitamin D supplementation potentially is an easy and cost-effective therapy, with minimal side effects," said Sue M. Penckofer, Ph.D., R.N., lead author of the study and a professor in the Niehoff School of Nursing. "Larger, randomized controlled trials are needed to determine the impact of vitamin D supplementation on depression and major cardiovascular risk factors among women with Type 2 diabetes." Dr. Penckofer recently received a four-year, $1.49 million grant from the National Institute of Nursing Research at the National Institutes of Health to do such a study. Dr. Penckofer and her Loyola co-investigators plan to enroll 180 women who have type 2 diabetes, symptoms of depression, and insufficient levels of vitamin D. Women will be randomly assigned to receive either a weekly vitamin D supplementation (50,000 International Units) or a matching weekly placebo for six months. The study is titled "Can the Sunshine Vitamin Improve Mood and Self Management in Women with Diabetes?” About 1 in 10 people in the United States has diabetes, and the incidence is projected to increase to 1 in 4 persons by 2050. Women with type 2 diabetes have worse outcomes than men. The reason may be due to depression, which affects more than 25 percent of women with diabetes. Depression impairs a patient's ability to manage her disease by eating appropriately, exercising, taking medications, etc. Researchers at the Cedars-Sinai Samuel Oschin Comprehensive Cancer Institute have uncovered for the first time the vital role a well-known protein plays in the stroma, the cell-lined area outside of a prostate tumor. Researchers have long understood the function of the protein, caveolin-1 (Cav-1), in prostate cancer, including its role in treatment resistance and disease aggressiveness. However, prior to this study, little was known about the role of Cav-1 within the stroma. The study, published online on May 31, 2013 in the Journal of Pathology, found that a decreased level of the Cav-1 protein in the stroma indicated tumor progression — a function opposite to the known role of Cav-1 within a tumor. Inside the tumor, an increased level of this protein signifies tumor progression. These human tumor findings suggest that patients whose prostate tumor is surrounded by a stroma with decreased levels of the Cav-1 protein may have an overall worse prognosis and a higher chance of disease relapse. "How a prostate tumor communicates with its microenvironment, or stroma, is a vital process we need to understand to assess the aggressiveness of a patient's disease and potential response to treatment," said Dolores Di Vizio, M.D., Ph.D., associate professor in the Urologic Oncology Research Program and senior investigator of the study. "This research suggests that the cells surrounding a prostate tumor are equally as important as the tumor itself in helping understand the complexity of a man's disease. This early-stage research may provide a new, future marker that may ultimately aid diagnosis and treatment, and personalize prostate cancer therapy." In addition to understanding the role of Cav-1 in the tumor microenvironment, researchers discovered that the loss of Cav-1 causes an increase of cholesterol in the stroma. Researchers at the Hebrew University of Jerusalem and in California have achieved a breakthrough in understanding how and why a promising anti-cancer therapy has failed to achieve hoped-for success in killing tumor cells. Their work could lead to new insights into overcoming this impasse. The problematic therapy investigated involves suppression of the protein mTOR (mammalian target of rapamycin). mTOR plays an important role in regulating how cells process molecular signals from their environment, and it is observed as strongly activated in many solid cancers. Drug-induced suppression of mTOR has until now shown success in causing the death of cancer cells in the outer layers of cancerous tumors, but has been disappointing in clinical trials in dealing with the core of those tumors. Reduced oxygen supply -- hypoxia -- is a near-universal feature of solid tumors that can alter how tumors respond to therapies. It was known that the behavior of mTOR signaling is influenced and altered by the condition of hypoxia, but the mechanism to explain this was unknown. A research team, which included Professor Emeritus Raphael D. Levine of the Institute of Chemistry at the Hebrew University of Jerusalem and researchers from the California Institute of Technology and the David Geffen School of Medicine at UCLA, investigated whether the influence of hypoxia on mTOR signaling in model brain cancer systems could explain the poor performance of mTOR drugs. Their work appeared in a recent article in PNAS. For their investigation, they employed a new microchip technology that allowed them to measure the mTOR protein signaling network in individual cancer cells, and they interpreted the results using a new set of theoretical tools derived from the physical sciences. The combined approach permitted the simplification of an otherwise complex biological system. Synchrotron imaging has revealed an ancient odd couple - 250 million years ago, a mammal forerunner and an amphibian shared a burrow (synchroton image at left shows contents of fossilized burrow). Scientists from South Africa, Australia, and France have discovered a world-first association while scanning a 250-million-year-old fossilized burrow from the Karoo Basin of South Africa. The burrow revealed two unrelated vertebrate animals nestled together and fossilized after being trapped by a flash flood event. Facing harsh climatic conditions subsequent to the Permo-Triassic (P-T) mass extinction, the amphibian Broomistega and the mammal forerunner Thrinaxodon cohabited in a burrow. Scanning shows that the amphibian, which was suffering from broken ribs, crawled into a sleeping mammal's shelter for protection. This research suggests that short periods of dormancy, called aestivation, in addition to burrowing behavior, may have been a crucial adaptation that allowed mammal ancestors to survive the P-T extinction. The results of this research were published online in an open-access article in PLoS ONE on June 21, 2013. The international team of scientists was led by Dr. Vincent Fernandez from Wits University, South Africa and the European Synchrotron Radiation Facility (ESRF) in Grenoble, France. The other authors from Wits University included Professor Bruce Rubidge (Director of the newly formed Palaeosciences Centre of Excellence at Wits), Dr. Fernando Abdala, and Dr. Kristian Carlson. Other authors include Dr. Della Collins Cook (Indiana University); Dr. Adam Yates (Museum of Central Australia), and Dr. Paul Tafforeau (ESRF). When green algae "can't breathe," they get rid of excess energy through the production of hydrogen. Biologists at the Ruhr-Universität Bochum in Germany have found out how the cells notice the absence of oxygen. For this, they need the messenger molecule nitric oxide and the protein hemoglobin, which is commonly known from red blood cells of humans. With colleagues at the UCLA, the Bochum team reported its results online on June 10, 2013 in PNAS. In the human body, hemoglobin transports oxygen from the lungs to the organs and brings carbon dioxide, which is produced there, back to the lungs. "However, scientists have known for years that there is not just the one hemoglobin," says Professor Thomas Happe from the Work Group Photobiotechnology. Nature has produced a large number of related proteins which fulfill different functions. 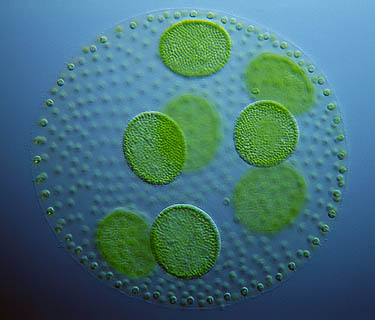 The green alga Chlamydomonas reinhardtii has what is known as a "truncated" hemoglobin, the function of which was previously unknown. Dr. Happe's team has deciphered its role in surviving in an oxygen-free environment. When Chlamydomonas has no oxygen available, the algae transfer excess electrons to protons, creating hydrogen (H2). "For this to work, the green alga activates a certain gene program and creates many new proteins," Dr. Happe explains. "But how exactly the cells even notice that oxygen is missing is something we did not know." The research team looked for genes that are particularly active when green algae have to live without oxygen – and found a gene that forms the blueprint for a hemoglobin. In an oxygen-rich environment, however, this gene was completely idle. The scientists studied the hemoglobin protein and its genetic blueprint in more detail using molecular biological and biochemical analyses. "One thing became clear very quickly," says Dr. Researchers in Berlin and Munich, Germany and Oxford, United Kingdom, have revealed that a protein well known for its role in Alzheimer's disease controls spindle development in muscle and leads to impaired movement in mice when the protein is absent or treated with inhibitors. The results, which were published online on June 21, 2013 in an open-access article in The EMBO Journal, suggest that drugs under development to target the beta-secretase-1 protein, which may be potential treatments for Alzheimer's disease, might produce unwanted side effects related to defective movement. Alzheimer's disease is the most common form of dementia found in older adults. The World Health Organization estimates that approximately 18 million people worldwide have Alzheimer's disease. The number of people affected by the disease may increase to 34 million by 2025. Scientists know that the protein beta-secretase-1 or Bace1, a protease enzyme that breaks down proteins into smaller molecules, is involved in Alzheimer's disease. Bace1 cleaves the amyloid precursor protein and generates the damaging Abeta peptides that accumulate as plaques in the brain leading to disease. Now scientists have revealed in more detail how Bace1 works. "Our results show that mice that lack Bace1 proteins or are treated with inhibitors of the enzyme have difficulties in coordination and walking and also show reduced muscle strength," remarked Dr. Carmen Birchmeier, one of the authors of the paper, Professor at the Max-Delbrück-Center for Molecular Medicine in Berlin, Germany, and an EMBO Member. "In addition, we were able to show that the combined activities of Bace1 and another protein, neuregulin-1 or Nrg1, are needed to sustain the muscle spindles in mice and to maintain motor coordination." Muscle spindles are sensory organs that are found throughout the muscles of vertebrates. A new study by a team of researchers from the University of Notre Dame provides an important new insight into how cancer cells are able to avoid the cell death process. The findings may suggest a chemotherapeutic approach to prevent the spread of cancers. Metastasis, the spread of cancer from one organ to other parts of the body, relies on cancer cells’ ability to evade a cell death process called anoikis, according to Dr. Zachary T. Schafer, Coleman Assistant Professor of Cancer Biology at Notre Dame. 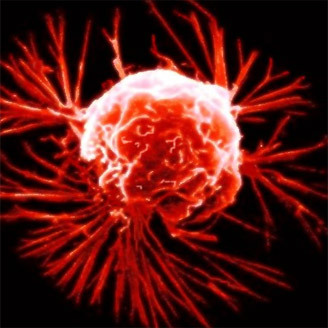 Metastasizing cancer cells are able to survive anoikis, which normally results from detachment from the extracellular matrix. However, Schafer notes that the molecular mechanisms cancer cells detached from the extracellular matrix use to survive has not been well understood. "This paper reveals that cancer cells that are detached from their normal environment, as they would be during metastasis, rely on the activity of antioxidant enzymes to facilitate their survival," Dr. Schafer said. "This class of enzymes is critical for neutralizing oxidative stress and function much like the compounds that are present in a variety of foods." The paper describes a prominent role for antioxidant enzymes in facilitating the survival of breast cancer cells after detachment from the extracellular matrix. Conversely, the researchers report, silencing antioxidant enzyme expression reduced tumor formation. "The results in this paper suggest that targeting antioxidant enzymes with novel therapeutics may selectively kill off metastasizing cancer cells," Dr. Schafer said. The paper appears in the June 15, 2013 issue of Cancer Research, which is the most frequently cited cancer journal in the world. The research team collaborated with Dr. Matthew Leevy in Notre Dame's in vivo imaging facility.